The Advanced Masters in European law (LL.M. in European law) is organised by the Faculty of Law and Criminology of the ULB under the aegis of the ULB Institute of European Studies. The academic coordinator of the LL.M. is the head of the Centre for European Law, Emmanuelle Bribosia. Why choose the ULB LL.M. in European law? The LL.M. 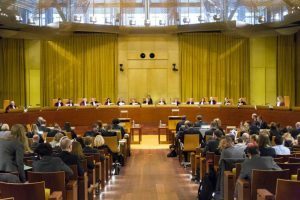 in European law is aimed at students who would like to develop recognised expertise in EU law and to take advantage of the exceptional location of the ULB in this respect. In order to train legal experts fully versed in the practice of the law of the EU, the academic staff is made up of top level professors who bring together researchers attached to the ULB or to other international universities (European University Institute of Florence, HEC Paris etc.) as well as well reputed lawyers and members of European institutions (Court of Justice of the European Union, European Commission etc.). Within one cohort, bringing together students from all over the world, students will be able to analyse the most recent developments in EU law whilst appreciating its evolution vis a vis their national systems. To do so, the Masters course is based on an interactive approach to teaching during the course via simulated negotiations or moot courts to allow students to put their acquired knowledge directly into practice. The Masters course specialising in European law is bilingual. The classes are given in one of the following languages: French or English. In addition, the Masters relies partly on the ULB Institute of European Studies, which, alongside its interdisciplinary research on European integration, has research teams specialising in European criminal law, in fundamental rights, in European asylum and immigration law and in economic law, who help provide content for the classes and to fuel the debate around the process of European integration. What are the career prospects like? ge at the Court of the European Union, law clerk at the Court of Justice, administrators within the European, international or national institutions, lawyers acting in different branches of EU law, officials in NGOs or interest groups and European law teachers and researchers. What is the LL.M. programme in European law? It comprises a core element (European constitutional law, jurisdictional protection in the EU, external relations law of the European Union as well as a course aiming to cover current European integration issues) that is compulsory for all students. If they so wish, students will have, in addition, the chance to orient their course to a specific area of European law, whether that be European economic law or Area of freedom, security and justice. Dissertation (TFE) in the form of participation (subject to selection) in a moot court competition. The ULB’s students’ portal provides all the information with regard to the practical organisation of the course. What are the admission criteria for the LL.M. in European law? As it is a Master’s course specialising in law with the objective of training experts in EU law, access to the LL.M. is in principle restricted to holders of a 120 Masters in law or to holders of foreign degree certificates that are deemed to be equivalent to that. However, candidates who do not fulfil those conditions can also access the LL.M. subject to the approval of a jury. The Master’s course is bilingual. The courses are given in English or in French. A certain level of French (minimum B2 level according to the European framework) is required to be allowed onto the LL.M. How do you sign up for the LL.M. in European law? All the information relating to the registration procedure for the LL.M. in European law is available on the website of the Université Libre de Bruxelles. Students from countries outside the EU can submit their application from 19 February to 30 April. Students from countries of the EU can submit their application from 1 April to 30 September. Already students? Here is all the practical information!